Patients ≥2 years old with ankle or midfoot pain/tenderness in the setting of trauma. The Ottawa Ankle Rule was derived to aid efficient use of radiography in acute ankle and midfoot injuries. Sensitivities range from the high 90-100% range for “clinically significant” ankle and midfoot fractures, defined as fracture or avulsion >3 mm. Specificities are approximately 41% for the ankle and 79% for the foot, though the rule is not designed or intended for specific diagnosis. The Ottawa Ankle Rule is useful for ruling out fracture (high sensitivity), but poor for ruling in fractures (many false positives). Do not neglect the importance of medial malleolar tenderness. Use with caution in patients under age 18. Gross swelling which prevents palpation of malleolar tenderness. Encourage follow-up in 5-7 days if pain and ability to walk are not better. Patients without criteria for imaging by the Ottawa Ankle Rule are highly unlikely to have a clinically significant fracture and do not need plain radiographs. Application of the Ottawa Ankle Rule can reduce the number of unnecessary radiographs by as much as 25-30%, improving patient flow in the ED. If ankle pain is present and there is tenderness over the posterior 6 cm or tip of the lateral or medial malleolus, then ankle x-ray is indicated. If midfoot pain is present and there is tenderness over the navicular or the base of the fifth metatarsal, then foot x-ray is indicated. If there is ankle or midfoot pain and the patient is unable to take four steps both immediately and in the emergency department, then x-ray of the painful area is indicated. RICE plan (Rest, Ice, Compression, Elevation). Splinting/crutches and pain medication, pending outcome. Patients who fulfill none of the Ottawa Ankle Rule criteria do not need an ankle or foot x-ray. Those fulfilling either the foot or ankle criteria need an x-ray of the respective body part. Many experts would consider this score “one directional.” Because the rule is sensitive and not specific, it provides a clear guide of which patients not to x-ray if all criteria are met. However, if a patient fails the criteria, need for x-ray can be left to clinical judgment. Inability to bear weight both immediately after injury AND in ED. Included non-pregnant patients over age 18 who presented to Ottawa Civic and General Hospitals with a new injury <10 days old. 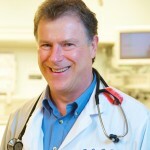 Initial pilot study with 155 patients while full-scale study included 750 patients. Clinically significant fracture = any fracture that was not an avulsion of ≤3 mm across. Initial rules: Age 55 years or greater, inability to bear weight immediately after the injury and for four steps in the emergency department, or bone tenderness at the posterior edge or tip of either malleolus for the ankle. For the foot, criteria included pain in the midfoot and bone tenderness at the navicular bone, cuboid, or the base of the fifth metatarsal. Prospective study of 1,032 patients in the validation and refinement phase of the study with 121 clinically significant fractures. Sensitivity of 100% for significant malleolar zone fractures and 98% for significant midfoot fractures. Rules further refined by removing age cut-off from ankle rule and cuboid tenderness from foot rule, but also added weightbearing criteria to foot rule. Sensitivity of refined rule for both foot and ankle fractures was 100%, but increased ankle specificity to 41% and foot specificity to 79%. An additional 453 patients were then prospectively enrolled in the second phase of the study, where they validated their refined rules, yielding a sensitivity of 100% for both ankle and midfoot fractures. A study of 670 children age 2 to 16 at two separate sites found that the rule again had a sensitivity of 100% for both clinically significant ankle and midfoot fractures. Study also found that ankle x-rays could be reduced by 16% and foot x-rays by 29% if the rules were in use at the time of the study. Subsequent meta-analysis of the rule in children found 12 studies with 3,130 patients and 671 fractures, with a pooled sensitivity of 98.5% and overall reduction in x-ray utilization by 24.8%. Stiell IG, Greenberg GH, McKnight RD, Nair RC, McDowell I, Reardon M, Stewart JP, Maloney J. Decision rules for the use of radiography in acute ankle injuries. Refinement and prospective validation. JAMA. 1993 Mar 3;269(9):1127-32. Stiell, I.G., R.D. McKnight, G.H. Greenberg et collab. 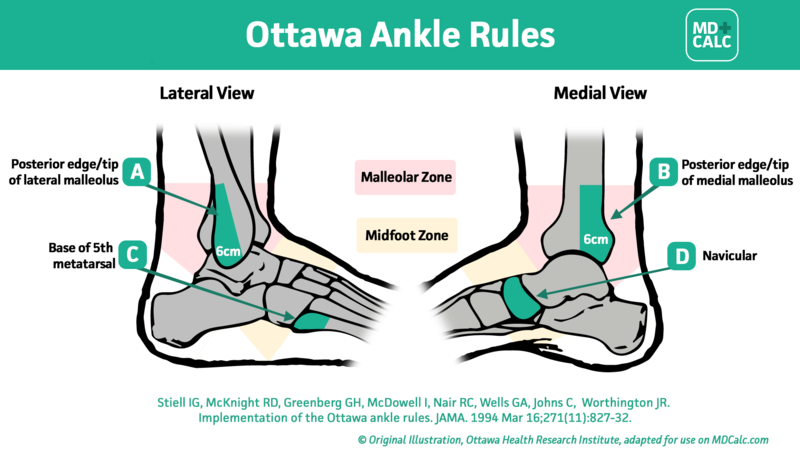 Implementation of the Ottawa Ankle Rules. JAMA, no 271. 1994, p. 827-832. Stiell IG, Wells GA, Laupacis A, Brison R, Verbeek R, Vandemheen K, Naylor CD. A multicentre trial to introduce clinical decision rules for the use of radiography in acute ankle injuries. Br Med J 1995;311:594-597. Plint AC, Bulloch B, Osmond MH, Stiell I, Dunlap H, Reed M, Tenenbein M, Klassen TP. Validation of the Ottawa Ankle Rules in children with ankle injuries. Acad Emerg Med. 1999; 6(10)10005-9 Bachmann LM, et. al. Accuracy of Ottawa ankle rules to exclude fractures of the ankle and mid-foot: systematic review BMJ 2003;326:417. doi: http://dx.doi.org/10.1136/bmj.326.7386.417 (Published 22 February 2003). Why did you develop the Ottawa Ankle Rule? Was there a clinical experience that inspired you to create this rule for clinicians? We found that emergency doctors were ordering many imaging studies for ankle injuries that were then found to be normal. I thought if there were a set a rules with criteria developed by emergency physicians, for emergency physicians, they would help this problem and shorten emergency department wait times and costs. What pearls, pitfalls and/or tips do you have for users of the Ottawa Ankle Rule? Are there cases when it has been applied, interpreted, or used inappropriately? As a general rule in the emergency department, x-rays are rarely useful because most injuries are soft tissue, and an x-ray does not show ligament injury. What recommendations do you have for health care providers once they have applied the Ottawa Ankle Rule besides imaging, or when imaging is negative? If the rule states imaging is required, rarely does a patient need both an ankle and foot x-ray, just one or the other or neither. If negative, most patients will heal quickly from a soft tissue ankle injury, but some may require physical therapy. What are some situations in which you see clinicians interpreting the rule improperly or incorrectly leading to inappropriate x-ray utilization? Sometimes doctors don't properly assess the patient's ability to bear weight on their injured ankle. Most patients can and will walk, but it may take a little encouragement from the physician.